Several years ago I went to a dumpling restaurant in New York City. We had been told that the soup dumplings were amazing and they were. Delicious broth encased in a delicate dough. If you are ever in New York City you must check Joe’s Shanghai out. Enough about the dumplings this post is supposed to be about the pancake, even though you must try the dumplings too. 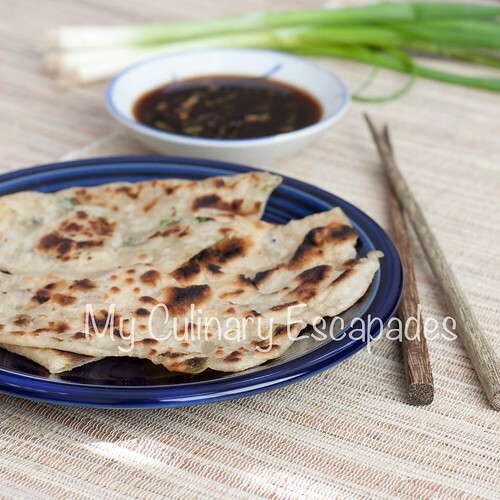 When we looked over the menu we decided on scallion pancakes as an appetizer. I love onions and pancakes so I didn’t think we could go wrong. I wasn’t prepared for one of the best foods of my life though. Flaky and delicious. The dipping sauce was tangy and spicy. It was love at first bite. You know that show on Food Network, Best Thing I Ever Ate? Well, if I was on the pancake show this would be the best thing I ever ate. I still dream about going back and having them again. In fact if Chinatown wasn’t so far away from Times Square we would have eaten them on our last night in NYC. When I came home I searched high and low for a restaurant in Phoenix that made some. It was pretty hard to find so I decided I needed to make them myself. I tried several recipes and finally went with this one. The dipping sauce is spot on. The pancakes at Joe’s were thicker but these replicate the flaky texture and light sesame seed taste. Add the flour into your food processor and put the lid on. Turn on high and stream the boiling water into the processor until it forms a ball. Dust countertop with extra flour and cover ball of dough allowing it to relax on the counter for 30 minutes. While dough is resting mix ingredients for the dipping sauce together and set aside. Mix both oils together in a small dish and set aside. On a floured surface, roll out dough into a thin rectangle. Brush on oil mixture, cover with scallions and season with salt and pepper. Carefully roll dough like a sponge cake. Cut into 6 pieces. Take one piece and twist it 3 times. Make a spiral out of this and roll again and flatten to acheive a 5 to 6 inch pancake. In a hot non-stick pan coat with the oil mixture and pan sear both sides until golden brown. Cut into wedges and serve immediately with dipping sauce. This makes a great side to your dinner. I like to serve it with fish and vegetables.